The UK and EU have formally set out plans for World Trade Organization commitments post-Brexit, but they have already been opposed by some countries. The issue is about how much of certain goods can be imported at reduced tariffs after Brexit. These quotas currently apply to imports anywhere in the EU. But seven nations, including the US and Canada, have already made it clear that they think plans to divide existing quotas will put them at a disadvantage. After Brexit, exporters of goods will need to know what access they can expect to the separate markets of the UK and EU. The dissenting nations object to proposals from London and Brussels about how they plan to handle access to their markets for about 100 mainly agricultural goods. 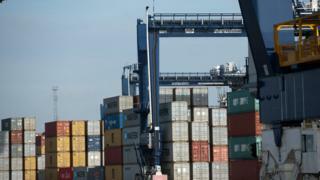 They feel that proposals for dividing quotas for goods imported at reduced tariffs will leave them worse off. This is perhaps the most difficult aspect of Britain untangling its WTO membership from the EU. Its status as a member is not an issue. The UK is a full founding member of the organisation. But the commitments made to other members of the WTO have been done through the EU. The government has said that it intends to replicate those arrangements so far as possible. In some respects, it is likely to be straightforward. Where the EU commitment is that the tariffs (or taxes) on certain types of goods will be no more than a certain level, the UK can simply take on that same commitment (and, incidentally, be free to impose a lower tariff if it chooses). But where the commitment is to allow a certain quantity of imports at a reduced tariff, sometimes tariff-free, then it becomes more difficult. How do you allocate that quota between the UK and the EU? Indeed, do you just allocate the existing quota? Some other trade partners think that isn't good enough. The EU and the UK have agreed a method and they have set it out in a letter sent by the heads of the two WTO delegations in Geneva to their opposite numbers from other member nations. The letter says the new commitments will come from "an apportionment of the EU's existing commitments, based on trade flows under each tariff-rate quota". The word "apportionment" suggests the new totals would be the same as the EU's current quotas. Some WTO members think that is not acceptable. Word had got out that a proposal on those lines was in the works. So a group of seven of them wrote to the UK and the EU, as it were, to get their retaliation in first. They said they need to be involved in negotiations, and the implication of their letter is that the two lots of new quotas should add up to more than the EU's current level. Why? Because currently they can sell, for example, sheep and goat meat up to the quota (283,825 tonnes, if you want to know) duty-free anywhere in the EU. If demand in the UK is weak or prices lower one year, they can simply sell some extra in another EU state. But with separate quotas, that would no longer be the case. They could also lose the ability to ship it all to a single EU port and then move it on from there, adding to the exporters' costs. So there's a case for saying that leaving them no worse off means a larger overall quota. But that would mean more competition for the UK and European producers that the tariffs are intended to protect. It's also interesting to note which countries have raised the objection in the WTO. They include three that have been identified as leading candidates for free-trade deals with the UK post-Brexit: the US, Canada and New Zealand. Their objections to the specific proposals on tariff rate quotas certainly don't mean they will be unwilling to do deals. But it is a reminder that they can be expected to negotiate vigorously to promote their own national interests.